Painting, in watercolour and tin alloy on paper, episode of the Tarakeshwar affair. Image of the Mahant fanning Elokeshi who is seated in a chair, whilst the priest dressed in a dhoti and shawl stands behind her cooling her with a fan. Historical significance: Calcutta was the capital of British India from 1833-1912. 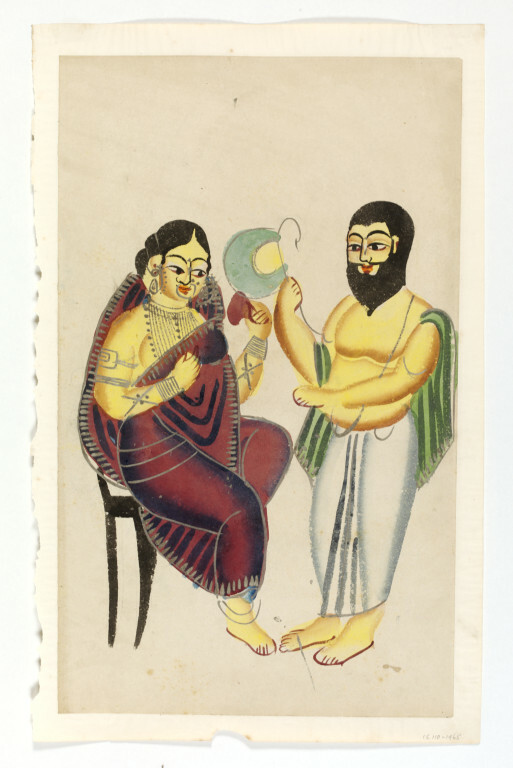 By the 1830s, artists had arrived from rural villages in Bengal and began to produce paintings that reflected local history, mythology, customs and conflicts of a colonised society. 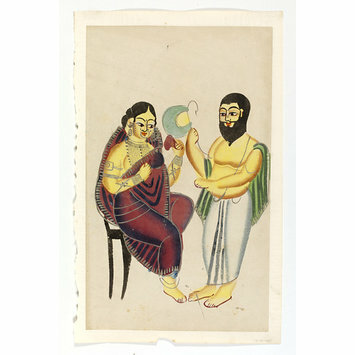 As a popular art form, these artists are recognised for their use of brilliant colour, simplified images and swift brushstrokes that became the hallmark of Kalighat painting in the 19th and early 20th century. Archer suggests that the artist's depiction of heat maybe suggestive of the mounting tension between the priest and the clerk's wife. Following her first visit to the Tarakeshwar shrine, Elokshi became the mistress of the priest and this image depicts the 'slavish subservience' to which she appears to have reduced him. (Archer, p 61). Jain, J (1999) 'Kalighat Painting: Images from a Changing World', Ahmedabad, Mapin. pl. 29, cat. no. 17,x: p.61.